The monograph Louisiana Trail Riders, by LSU School of Art associate professor of photography Jeremiah Ariaz, was released by UL Press August 28, 2018. “I’d like to thank James Wilson, Assistant Director at UL Press, who championed the project and granted me the freedom to create precisely the book I envisioned,” Ariaz said. “Thanks Alexandra Giancarlo & Courtney Reid-Eaton for offering thoughtful and researched text to accompany the work, Henry Jackson who first encouraged me to join with and photograph the riding clubs, and all the riders who graciously invited me along. The book premiered at the annual Billy Reid Shindig 10 in Florence, AL. Shindig began ten years ago to celebrate food, fashion, music, and art. “I’m honored to be included and excited to celebrate the book’s release,” Ariaz said. The Louisiana Trail Riders monograph features photographs from Ariaz’s research project Louisiana Trail Riders. The series depicts African American trail-riding clubs in Louisiana, asserting a counter-narrative to historic representations of the cowboy and prevailing contemporary images of difference and despair in Black America. “In 2014 while riding my motorcycle in rural Louisiana, I encountered a large group of people riding horseback. They commanded the road, and I pulled over for them to pass. I retrieved my camera from the saddlebag of my bike and took a few photographs as they rode by. A gentleman near the end of the procession waved, encouraging me to join. So began my ride as witness to the trail-riding clubs,” Ariaz said. 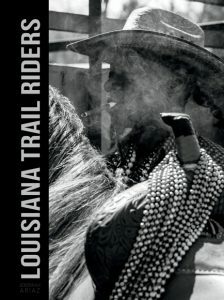 Louisiana Trail Riders is available from UL Press, as well as select bookstores and Amazon. Jeremiah Ariaz, creates works that explore both the geography and ideology of the American West. He received his BFA from the Kansas City Art Institute and MFA from the State University of New York at Buffalo. 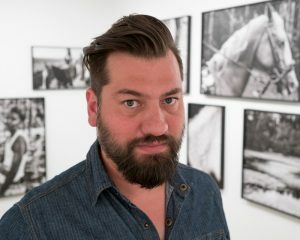 Ariaz has exhibited and been invited to speak about his photography internationally. Projects include Staging the West, Tucumcari, Reconsidering Landscape, Shadow Root: Retracing the Santa Fe Trail, Fact and Fiction: Imaging the West, and Louisiana Trail Riders. Louisiana Trail Riders is the first project set in his adopted Southern home of Louisiana where he is an Associate Professor of Art at Louisiana State University.